This block boasts several of the greatest private mansions ever built in the city, now occupied by the Smithsonian Institution's National Museum of Design, the Sacred Heart School and the Russian Consulate. In addition, it has the prestigious Spence School, a pizza parlor and a hamburger joint. This very attractive, 16-story, gray-brick, building was erected in 1948. It is a cooperative with 43 apartments. It was designed by Leonard Schultze & Associates, which also designed 47 East 87th Street. It is distinguished by a cantilevered pier of bay windows on Madison Avenue and a very handsome glass grill at its northern end on the avenue. The building has a green canopy with chrome entrance doors, some terraces, a doorman, sidewalk landscaping, and a two-story limestone entrance surround. It has no garage, and no health club. Its apartments facing the avenue overlook the controversial site of a proposed high-rise luxury apartment building on the northeast corner that for several decades was occupied by a one-story Citibank building of uninspired design (see The City Review article). 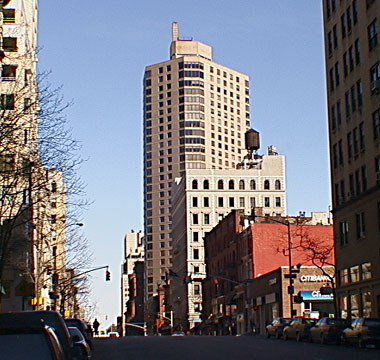 Community activists twice in 2000 successfully defeated proposals before the city's Landmarks Preservation Commission for first a 17-story and then an 11-story building on the site. The controversy reflected the vigorous community spirit in this Carnegie Hill neighborhood, which has many private schools and important cultural institutions. There is good cross-town bus service on 86th and 96th Streets.